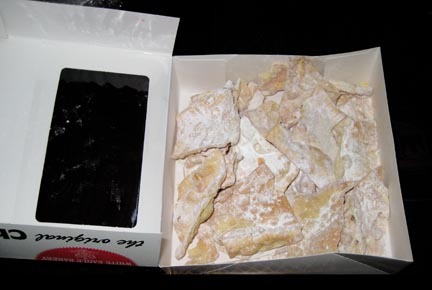 Having grown up in a Polish-American family, I am no stranger to those fried confections topped with a blizzard of powder sugar known as chrusciki. Before I was born, my maternal grandmother made them regularly, along with paczki (donuts), pierogi (filled dough pockets), and gołąbki (lit. pigeons; stuffed cabbage leaves). Once I came into the world, however, her time was taken by babysitting (me) and consequently, I got very few of those home-made treats. But...we lived in what once was a Polish neighborhood, and there were still bakeries in the area that could provide us with reasonable fascimiles of home-made. To my tastes anyway. My mother always liked to remind me that Mommy's were better, and having never tasted them, I couldn't argue. 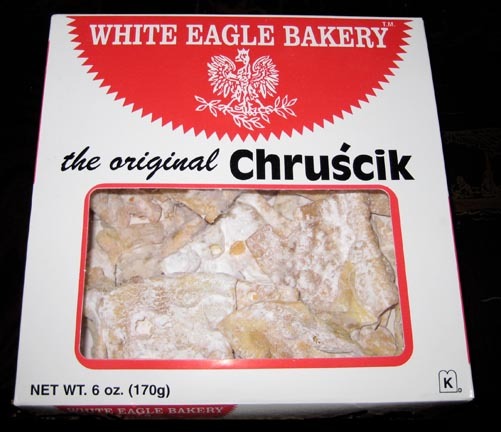 When Mr Minx and I shopped at Wegman's the other day, I spotted boxes of White Eagle chrusciki in the bakery aisle and bought one, for nostalgia's sake. Unfortunately, these did not turn out to be my madeleine. Fresh and tasty, they were not as fried/greasy as I recall, and there was perhaps a little too much powdered sugar. And most had broken in transit, leaving none in the actual familiar "bowtie" shape. I've had some nasty chrusciki in my day. 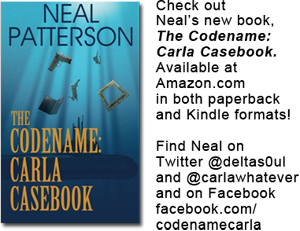 I remember, with no fondness whatsoever, those that our next-door neighbor, my grandmother's first cousin, brought us one afternoon. Her daughter made them, she bragged. Well, her daughter must have kept her powdered sugar next to a box of mothballs and a bag of dirty laundry, because that's what they tasted of. It was like eating deep fried gym socks. I choked down part of one to be polite, and Grandma discreetly trashed the rest of them once cousin Mary shuffled back home. If you are going to store powdered sugar, put it in Tupperware or some other storage container with an airtight seal and make sure the cover is on tight. It'll keep a little longer that way. Herman's Bakery in Dundalk, or the little Polish Store three doors down from Holy Rosary Church. Good Luck!